"Obrigado Brasil!" --an album of nine original bossa novas and sambas--is in a long lineage of CDs and original compositions by Eugene Marlow, including "Wonderful Discovery" that the Village Voice called "one of the best Latin albums of 2007." While Marlow has touched upon Brazilian music in the past, this album goes well beyond mere flirtations; Obrigado Brasil is a full-on embrace of Brazilian culture that serves as a thank-you card to the country that gave us samba, bossa nova, and so much more. 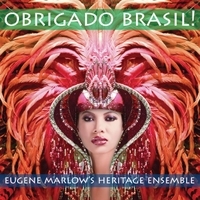 EUGENE MARLOW'S HERITAGE ENSEMBLE/Obrigado Brasil! : Swinging Brazilian-based works are on the original order of the day here. Solid work that highlights the musical trail from New York to the tropics, the gang really tears it up here on a smoking set that gets any party started in fine style. With a real feel for the mode at hand, Marlow and the gang are in touch with their inner "tropicalistas" and make you believe. Well done. "How refreshing is it to find a presentation of Brazilian jazz not loaded with the wonderful, yet well worn, tunes of Jobim and Bonfa? Pianist-composer Eugene Marlow’s inventive pieces capture the verve of the samba and the romance of the bossa nova with originality and interest, blended with occasional Afro-Cuban and classical tinges. A standout is “Carnaval a Sanabria,” a tour de force for master drummer-percussionist Bobby Sanabria"
"Obrigado Brasil!" is #28 for the week of November 5, 2016 on the Roots Music Report "Top 50 Jazz Albums Chart." WDNA Fusion Latino with Andy Harlow (Miami, FL) 09/27/2016 "Obrigado Brasil"
KRFC (Ft. Collins, CO) "Overnight Jazz" 9/28/2016 "Longing"
WDNA Latin Jazz Quarter (Miami, FL) 10/4/2016 "Arco's Arc"
WICN-FM, Jazz Highways with Rick McCarthy (Worchester, MA), 09/28/2016 "Novo Bossa"
WCVE Jazz with Peter Solomon (Richmond, VA) 10/5/2016 "Novo Bossa" & "Flight II"
KTEP Latin Jazz Connection with Juan Camarillo (El Paso, TX) 10/8/2016 "Novo Bossa"
WICN-FM Jazz Highways with Rick McCarthy (Worchester, MA) 10/11/2016 "Novo Bossa"
KTEP Latin Jazz Connection with Juan Camarillo (El Paso, TX) 10/15/2016 "As If Floating on a Cloud"
WNMC Afternoon Jazz with Bis Bisard (Traverse City, MI) 10/21/2016 "Flight II"
WMNF Latin Jazz & Salsa with Luis Speedy Gonzalez (Tampa, FL) "Arco's Arc"
KTEP Latin Jazz Connection with Juan Camarillo (El Paso, TX) 11/03/2016 "Obrigado Brasil!" KTEP Latin Jazz Connection with Juan Camarillo (El Paso, TX) 11/12/2016 "As If Floating on a Cloud"
WNMC (Traverse City, MI) "11/15/2016 As If Floating on a Cloud"
KTEP Latin Jazz Connection with Juan Camarillo (El Paso, TX) 11/19/2016 "Longing"
WNMC (Traverse City, MI) 11/21/2016 "Flight II"
KRFC (Ft. Collins, CO), 11/23/2016 "As If Floating on a Cloud"
WNMC (Traverse City, MI) 12/2/2016 "Carnaval a Sanabria"
WDNA (Miami, FL) 12/21/2016 "As If Floating on a Cloud"
WNMC (Traverse City, MI) 12/21/2016 "Obrigado Brasil"
WNMC (Traverse City, MI) 1/03/2017 "Twilight for Daniel"
WICN-FM Jazz Highways with Rick McCarthy (Worchester, MA), 01/10/2017 "Novo Bossa"
WDNA Latin Jazz Quarter with Orlando Suarez (Miami, FL), 01/13/2017 "Flight II"
WRNJ Bob Bernatos (New Jersey) 1/22/2017 "Arco's Arc"
WNMC (Traverse City, MI) 1/23/2017 "Flight II"
WNMC (Traverse City, MI) 1/26.2017 "Enigma"
WNMC (Traverse City, MI) 02/01/2017 "Obrigado Brasil"
WDNA (Miami, FL) 3/3/2017 "Obrigado Brasil"
WDNA (Miami, FL) 3/04/2017 "Arco's Arc"
WBGO (Newark, NJ) 3/7/2017 Awilda Rivera's Latin Jazz Cruise "Carnaval a Sanabria"
WDNA (Miami, FL) 3/14/2017 "Arco's Arc"
WBGO (Newark, NJ) 3/14/2017 Awilda Rivera's Latin Jazz Cruise "Flight II"
106.7 PBS-FM (Melbourne, Australia) Saul Zavarce/Fiesta Jazz, May 20, 2017 "Arco's Arc"
WMNF Latin Jazz & Salsa with Luis Speedy Gonzalez (Tampa, FL) May 28, 2017 "Flight II"
106.7 PBS-FM (Melbourne, Australia) Saul Zavarce/Fiesta Jazz, June 3, 2017 "Obrigado Brasil!" 106.7 PBS-FM (Melbourne, Australia) Saul Zavarce/Fiesta Jazz, June 24, 2017 "Novo Bossa!" WBGO (Newark, NJ) 8/8/2017 Awilda Rivera's Latin Jazz Cruise "Carnaval a Sanabria"
106.7 PBS-FM (Melbourne, Australia) Saul Zavarce/Fiesta Jazz, August 11, 2017 "Arco's Arc"
106.7 PBS-FM (Melbourne, Australia) Saul Zavarce/Fiesta Jazz, August 18, 2017 "Obrigado Brasil!"" KAJX Aspen Public Radio, Aspen, Colorado, "Jazz in Aspen with Jeannie Walla," August 23, 2017 "Novo Bossa." 106.7 PBS-FM (Melbourne, Australia) Saul Zavarce/Fiesta Jazz, September 16, 2017 "Carnaval a Sanabria"
KTEP Latin Jazz Connection with Juan Camarillo (El Paso, TX) 12/16/2017 "Novo Bossa"
“Obrigado Brasil!” is a nine-track album of original sambas and bossa novas by award-winning Heritage Ensemble leader/pianist/composer Eugene Marlow. It is also the 7th album from Marlow’s Heritage Ensemble. The album’s release follows the conclusion of the Summer 2016 Olympic Games in Rio De Janeiro, Brazil and the anniversary of Brazil’s independence from Portugal on September 7, 1822. A hybrid piece, “Enigma,” begins and ends in a classical vein with Virginia Chang Chien performing two coincident oboe lines. The bulk of the track is an improvisation on the chords by saxophonist Michael Hashim in a bossa nova style. The album’s final track—“Carnaval a Sanabria”--is a multi-layer drum and percussion celebration of the samba improvised by multi-Grammy nominee Heritage Ensemble drummer Bobby Sanabria. “Obrigado Brasil” is an album with a long pedigree. According to producer/composer Marlow, “My journey with Latin-jazz begins in England (where I was born) with my listening to the Edmundo Ros sextet perform—probably on early British television when I was very young. As a member of the Hunter College Choir (tenor) I was influenced by choir director Ralph Hunter, former Harry Belafonte music director. When we performed Hunter’s Belafonte calypso arrangements I played the bongos. While in the United States Air Force during the Vietnam era off-duty I formed a trio with Chicano-born drummer Rudy Merino who played bossa novas with brushes as if the rhythms were in his DNA, and virtuoso bass player Sonny Jay who had performed and recorded with Louis Jordan of “Caldonia” famous. This was also the era of the bossa nova made popular by guitarist/composer Antonio Carlos Jobim and “The Girl from Ipanema.” There were many bossa novas in our repertoire. “In the mid-2000s I became associated with 7X multi-Grammy nominee drummer Bobby Sanabria. I have since written 15 charts for his Grammy-nominated Multiverse Big Band and the Manhattan School of Music Afro-Cuban jazz Orchestra.